With the array rack in place, it was time to install the PV panels. Each one is 4 feet by 4 feet and secured to a special stairstep bracket that allows air to pass around it to help keep it cool. Ironically, the hotter the panels are, the less power they generate. The bracket also provides a nifty chase for the wiring that runs from the back of each panel. The brackets are bolted to aluminum rails which in turn are bolted to the steel pipe rack. Simple. The panels are Silicon Energy Cascade SiE195, made about an hour away in Marysville, Washington. They arrive in tidy flat stacks and are absolutely gorgeous. 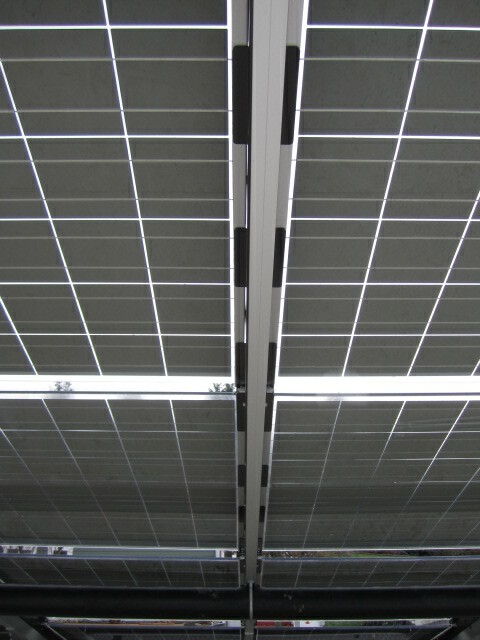 They have no aluminum frame like most PV panels. And they don’t have a white PVC backing, so they look great from below, which is how the homeowners will see them. The cells are spaced apart a little bit, so you can actually see the sky through the glass gaps. The electricity they generate is fed to two DC to AC inverters, SMA America Sunny Boy 8000-US (grey), which send electrons to the utility grid and to four AC to DC inverters, Sunny Island 5048-US (yellow). 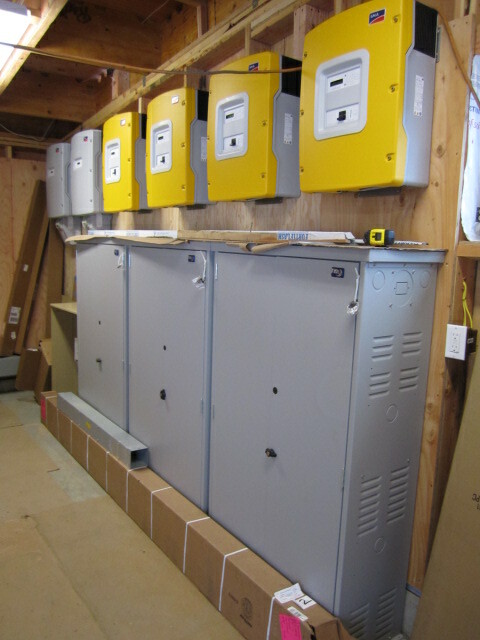 The yellow inverters charge the 24 on-site sealed-lead-acid batteries, Sun Xtender PVX-12150HT, that live in cabinets in the garage. If the power grid goes out, like it did for 300,000 people during a blizzard a few weeks ago in January 2012, the batteries can keep this house humming along.